Monday - Friday, 10 a.m. - 7 p.m.
Saturday, 8 a.m. - 5 p.m.
Sunday, 11 a.m. - 4 p.m.
No appointments needed. Open seven days a week. Holiday hours may vary. Our walk-in clinics offer convenient, affordable care for minor illnesses and injuries that aren't life threatening. Spend less time waiting in line when you're feeling under the weather. With Save My Spot, simply choose a CoxHealth Urgent Care or Walk-In Clinic location and time, fill out a basic form, and wait from the comfort of your home. 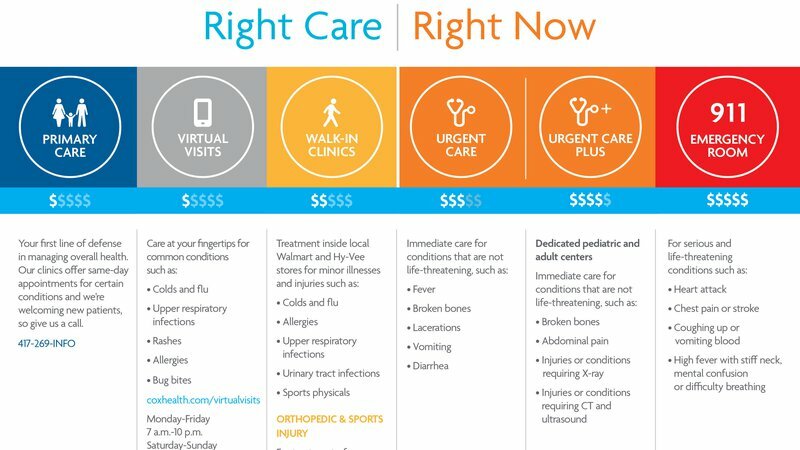 When you can't wait for an appointment with your health care provider, we're here for you with virtual visits, walk-in clinics, urgent care and emergency care. Not sure what level of care you need? Review this chart to help you decide. If you're experiencing a life-threatening illness or emergency, please immediately go to the nearest emergency room or call 911.